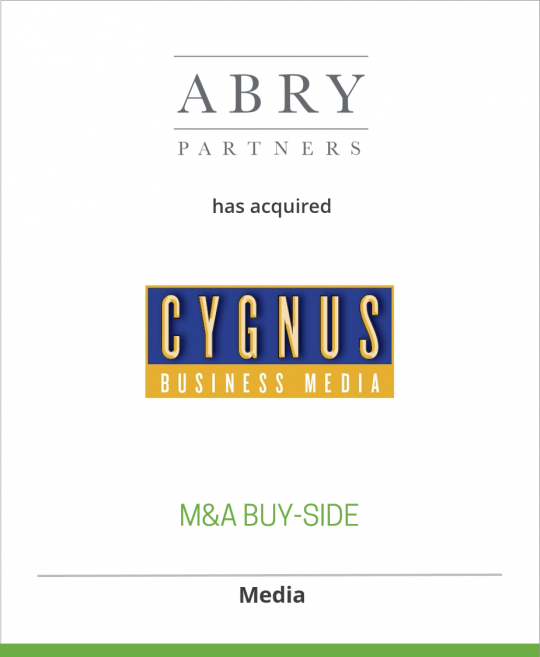 Commerce Connect Media, an affiliate of ABRY Partners, has acquired Cygnus Business Media, its 48 magazines and 16 trade shows. Cygnus Business Media is one of the country’s top business-to-business communications companies and boasts a portfolio of 140 unique properties, including 48 trade magazines, 16 trade shows and conferences, 17 custom publications, and 60 Web sites. It currently has leading positions in 8 major markets including imaging, public safety, transportation, construction equipment, shelter (both interior & exterior), agriculture & food, retail, and technology. Cygnus Business Media has projected revenues of approximately $100 million this year and employs over 430 people. In April 2000, the Company was named to the list of Folio Magazine’s 40 fastest-growing publishing companies. In the past several years, Cygnus has been active in building its online presence, its custom publishing area and its trade show division in addition to continuing to enhance opportunities within its highly successful trade magazine business. CommerceConnect Media, an affiliate of ABRY Partners, LLC, was launched in October 1999 and is a partnership between Paul Mackler, CEO, and ABRY Partners LLC, a private equity investment firm headquartered in Boston, MA which invests solely in media and communications companies. CommerceConnect Media was formed to acquire and expand a diverse group of products, including trade magazines, custom marketing communications, trade shows, conferences, and new media offerings, such as Web site advertising, Web site hosting capabilities, vertical market online auctions, and other e-commerce opportunities with its acquisition of Cygnus Business Media. ABRY’s investments include such notable companies as Avalon Cable, Citadel Communications, Connoisseur Communications, Muzak, Nexstar Broadcasting, Pinnacle Towers and Quorum Broadcasting. To date, the Company has invested more than $800 million in broadcast television, radio stations, cable television systems, transmission towers, recorded music companies, and motion picture exhibition firms to name a few, resulting in total transactions in excess of $7 billion.